2.45 p.m. R2 4 Cape Ceilidh (4 g Cape Blanco – Minkum, by Minardi) – Patrick Moloney; has blinkers on after a midfield run when resuming over 1400 metres on 26 November at Te Rapa, drawn barrier seven in the $10,000 Maiden 1600 metres. Stepping in distance suits, as will more ground – his dam won four races up to 2100 metres. Fixed odds: $33.00 & $7.80. 4.30 p.m. R5 2 The Boy Wonder (3 c Cape Blanco – Keep the Passion, by Keeper) – Patrick Moloney; scored a terrific win in the Maiden 3YO 1600 metres on 11 November at Te Rapa, before clipping heels and losing his rider in the Wellington Stakes (Gr. 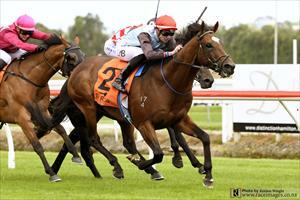 3, 1600m) on 1 December at Otaki. Drawn the ace (1) in the $50,000 3YO Salver (Listed, 2100m), he is expected to appreciate the trip and with Formidable (Shocking) dominates the betting. Fixed odds: $2.75 & $1.25.